Meet Mrs. Sarah and Mr. Seaborn. They purchased their home over twenty years ago in an effort to be closer to their children. As they have gotten older, keeping up with their property has become more difficult. Mr. Seaborn reached out to us asking for help building a ramp. You see, the landscaping was kept in order, the inside of the home was neat and clean, but when it came to building a handicap ramp for him and his wife, Mr. Seaborn was physically unable to do it. Imagine being a war veteran and not being able to provide a safe entryway for your wife. He just needed a little help. That’s where Jackson County Habitat for Humanity comes in. After meeting with Mrs. Sarah and Mr. Seaborn it became clear that this was a worthy project. 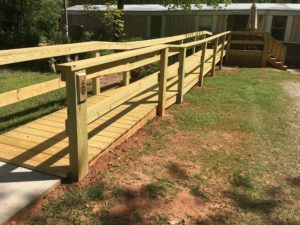 With the help of many volunteers, the Rotary Club of Jefferson, and Mr. Seaborn himself, we were able to build a handicap ramp that will accommodate the needs of him and his wife. 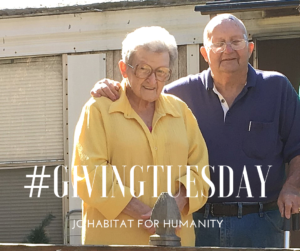 Because we are a hand-up, not a hand-out organization, Mr. Seaborn and Mrs. Sarah were asked to pay a portion of the materials cost back to JCHFH. And guess what? They were glad to. Mr. Seaborn was proud to write a small check monthly for the work that was done. The payments are used to help continue building ramps like this one. Why does #GivingTuesday matter? It matters because Mr. Seaborn and Mrs. Sarah are not the only ones in need of a hand-up. There is a huge need among our aging population. By joining our Hope Builders Club, making small monthly donations to JCHFH will afford us the ability to buy materials and build more ramps for people like this. Your giving can change lives. Think of someone you know that resembles Mr. Seaborn and Mrs. Sarah, give for them.